This page has been inspired by Professor W. McWorter, Jr.
Sierpinski's Triangle (or gasket as it is often called) is the standard example of a fractal constructed by "punching holes" in a solid figure. The holes are known as tremas. Start with a triangle (most often taken to be equilateral) and dissect it into four congruent parts, each similar to the original triangle. Delete the center part. Next, dissect each of the three remaining parts into four congruent triangles and delete their center parts. This leaves 27 little congruent triangles. Dissect each and remove their centers. Repeating this process ad infinitum, we still have something left over. What's left is a fractal called Sierpinski's Triangle. There is a convenient way to describe all the "holes" in Sierpinski's Triangle. With the first dissection label the four parts say, 0, 1, 2, and 3. Label the parts of these four parts 00, for the 0-th part of part 0, 01, for the 1-th part of part 0, ..., and 33, for the 3-rd part of part 3. When these 16 parts are dissected, we name them with a string of length three. For example, 103 is the third part of the 0-th part of part 1. After infinitely many dissections, each infinitesimal part is labelled by an infinite string of 0's, 1's, 2's, and 3's. With this labelling it is easy to describe all the "holes". If 0 is the label of the center part of a dissection, then the tremas consist of all parts whose label contains a 0. There is nothing sacred about the center part. One could remove any part. The tremas could be all parts whose label contains a 1, or all parts whose label contains the target substring, or "word", 220. The end result may or may not be a fractal but often is. The applet below allows you to choose whatever target "word" you want, up to 5 symbols. The string appears in the upper left corner of the applet. Its length is controlled by a spin/edit combination in the lower right corner. Each of the symbols in the string is clickable and changes cyclically - 0, 1, 2, 3. For the Sierpinski gasket, the string is "0". The ordering of the remaining triangles is inconsequential. This is not the case for more general trema strings. In general, the appearance of the resulting figure - fractal or not - is remarkably sensitive to the ordering of vertices in each of the four small triangles. These are controlled by a clickable device drawn just below the trema string. Clicks on the arrow heads cause vertex rotation, clicks inside the triangles affect vertex reflection. In this manner, all 6 elements of the triangle dihedral group are available for experimentation. The applet features three modes: "Fill", "Draw" and "Rich draw". In Fill mode, tremas are painted on the reversed background. The effect is as stipulated in their definition: they appear to be removed. In the latter two modes, the tremas are drawn, instead of being "removed." In Rich draw mode, the tremas are outlined. In Draw mode, they are marked by one median from the vertex with the "local" address "2". The allowed number of iterations is naturally restricting the length of the possible addresses. An additional device - the checkbox "ShowLongestOnly" - differentiates between marking all removed tremas and only those with the longest (for the given number of iterations) possible address. Note that, with the ShowLongestOnly box checked, the figure in the Draw mode becomes more conventional, in the Fill mode it grows blander. 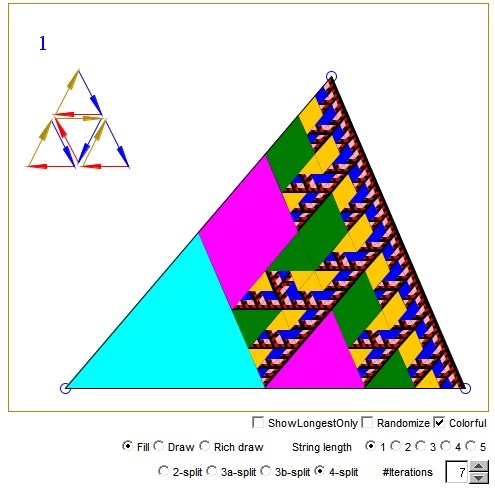 The applet also allows splitting triangles into two, and three (in two ways) not the usual four as in the Sierpinski gasket. In this case, the alphabet consists of just two symbols "0" and "1" (and "2"). One symbol string leads to trivial results, but already two symbols often define appealing figures. See for yourself.